In Sellards' 1916 Florida Geological Survey report, markings suggest evidence of humans. Figs. 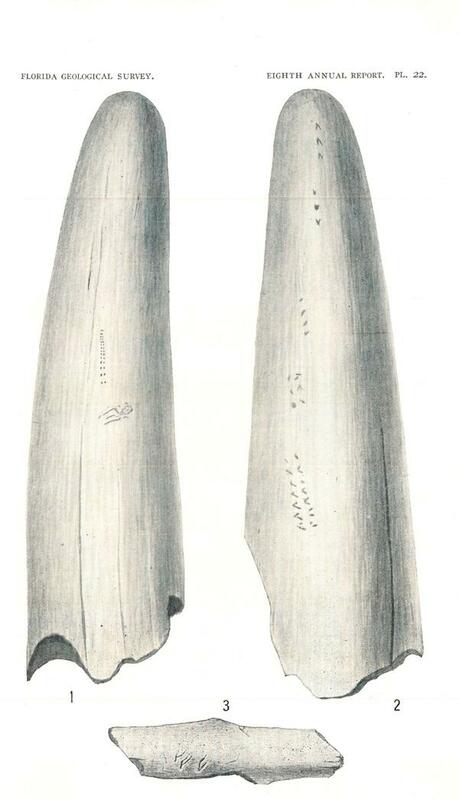 1-2 show engravings on a tusk from the Pleistocene of Florida. It's likely a lower, probodoscidian tusk of Mammut americanum. Fig. 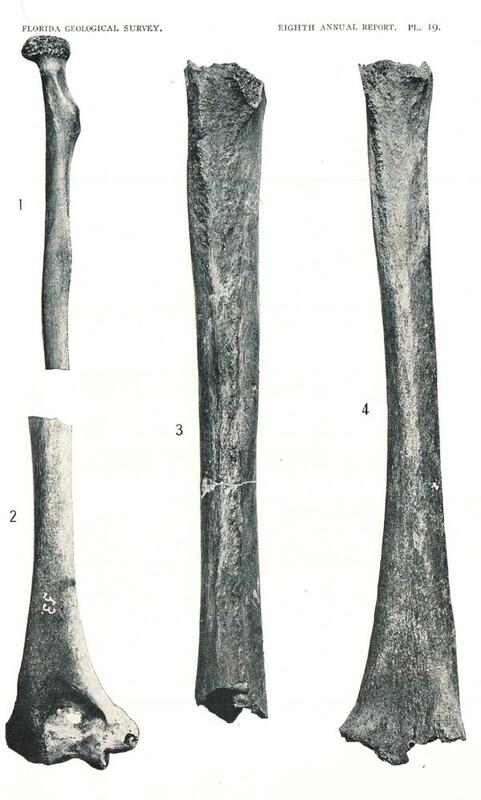 3 is a bird bone fragment with markings. Archaeologists have returned to a site in Florida that sparked a scientific controversy a century ago. In 1916, a geologist announced he found evidence in Vero Beach that humans lived there during the Ice Age. That was thousands of years earlier than the accepted scientific view at the time. The claims were discredited. NPR's Greg Allen reports the team now digging at the site is making finds they believe may vindicate that earlier work. GREG ALLEN, BYLINE: Today it's just a strip of land near an airport, but a century ago, it's a spot that became world-famous because of the work of Florida State geologist Elias Sellards. ANDY HEMMINGS: We're standing out on the point immediately adjacent to where Sellards did the bulk of his excavation. ALLEN: Andy Hemmings is with Mercyhurst University. He's the lead archaeologist on a project that has picked up where Sellards left off a century ago. In 1915, workers digging a drainage canal found fossilized animal bones and then human remains. Hemmings says Sellards led a scientific excavation of the site. HEMMINGS: Quite literally, where we're standing, they found what they, at the time, dubbed skeleton two and skeleton three. It turns out it's actually one individual now known as Vero Man. ALLEN: The human remains were in a layer of soil that also contained bones from animals that lived in Florida during the Ice Age - mastodons, giant sloths, sabertoothed cats. Sellards says this was proof that people lived in Florida during the Ice Age, at least 14,000 years ago. At the time, most scientists believed humans had been in the New World no longer than 6,000 years. An anthropologist from the Smithsonian led the charge attacking Sellards. Vero Man was discredited and became largely an archeological footnote. But in Vero Beach, a quiet community known mostly for its citrus groves, Sandra Rawls says the site of Sellards's investigation, and its potential, was never forgotten. SANDRA RAWLS: There were a lot of people who still remembered and knew a lot, are interested in the site. Many citizens had dug here, almost like a public park. Tons of fossils are in private collections that came out of here. ALLEN: Rawls, and others from the community, formed the Old Vero Ice Age Sites Committee and began raising money to fund a new archaeological investigation. That's when Mercyhurst University got involved. Archaeologists from the school began work on the site last year. HEMMINGS: So now we're down in our tents in our excavation. ALLEN: Backhoes have dug a large pit to remove several feet of soil. A 24-by-60-foot tent now protects the area. 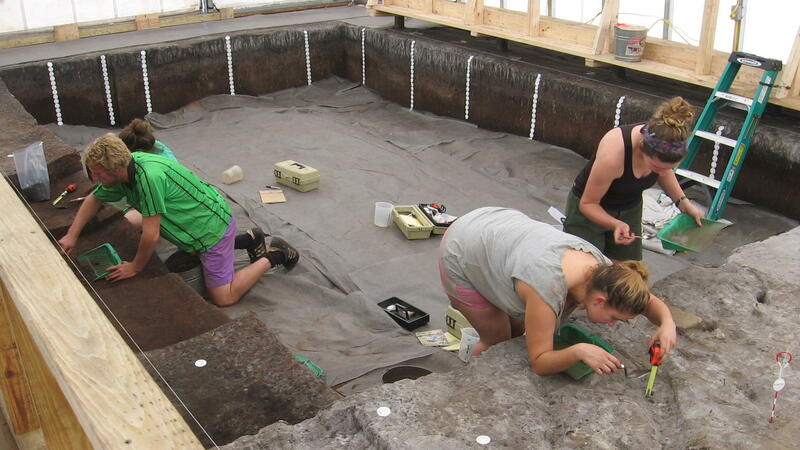 Inside under Hemmings's direction, several college students are painstakingly beginning work on a layer of soil that was on the surface during the Ice Age. HEMMINGS: We don't even use shovels. You see spoons and trowels right now, very delicately trying to keep track of if there's interesting objects in them - bones, artifacts. We want to know where they came from. ALLEN: In the first year, the dig uncovered a human artifact they believe dates back at least 11,000 years. But on a lower level, the crew uncovered charred remains of a dire wolf and an extinct horse. Hemmings says it suggests people lived on the site even earlier, at least 14,000 years ago. HEMMINGS: Our supposition is that all of this burnt material did not arrive naturally, that it really is from a hearth, that it is people burning and cooking on this landscape. ALLEN: Those are preliminary findings not yet published or subjected to the rigorous peer review process. In the past, many similar claims have been later debunked. If these findings hold up, the principal investigator at Vero, James Adovasio, says they'll help rewrite what we know about early man in the Americas. JAMES ADOVASIO: Vero becomes one of the earliest evidences of a human presence in the entire state of Florida, substantially older than it was thought to have been. It probably represents a lifestyle that we know very little about. ALLEN: Over the last few decades, archeologists have uncovered other sites that have pushed back estimates of when humans arrived in the New World. But so far, none of the oldest sites have yielded what many consider the smoking gun - human remains. John Shea, an anthropologist and expert on early man at Stony Brook University, says positively dated human remains would change a lot of minds. JOHN SHEA: The bar's set high, but, you know, there are people looking for these things and if, you know, the more they look, if there are genuinely fossils out there from this time period, they will find them. If they keep looking and they don't find them, well then, you know, one has to, you know, accept the hypothesis that maybe they aren't there. ALLEN: That's one of the things that makes Vero so intriguing - the possibility that human bones could be found there again and dated conclusively to that early time period. Greg Allen, NPR News, Miami. Transcript provided by NPR, Copyright NPR.